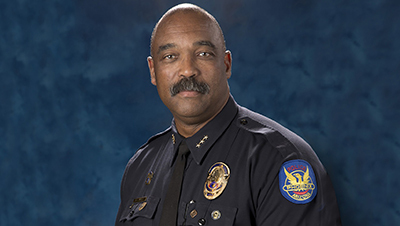 Harry Markley joined the First Responder Network Authority as law enforcement senior advisor after more than 30 years with the Phoenix Police Department. Markley started his career as patrol officer and was promoted through the ranks to assistant chief of police. In his three decades of service, he touched nearly every part of the department, serving as a narcotics detective, training officer, SWAT team commander, crime lab administrator, precinct commander, and director of the State Police Academy. As assistant chief, Markley led the patrol division; the tactical response team, which was responsible for all crowd control; and the downtown operations unit, which handled all of the city’s sporting events. We recently talked to Markley about his career, the evolution of communications in policing, and the promise of FirstNet. How did you see communications tools and methods change during your career? Markley: When I first came on to the police department, we were not even issued radios. We had a radio in the car. As long as you were close to the car, you were okay. And then it was a radio that slid into your car to charge and you had to turn it in every night. If you had two people in the car, you shared one radio. Probably back in the mid 1990s, they issued us all our own radios. They weren’t 800 Mhz. We had great communications with dispatch, but if we were more than four or five blocks from the officer on the other side of the radio we couldn’t hear each other. Then we moved to 800 MHz, which allowed us to increase the distance at which we could talk person to person. We also went to in-car computers during my career, which was another big deal. When I first came on, if you wanted to run someone’s information and find out if they had a criminal record you had to radio it in. Then you had to stand outside your car and talk to that person for 30 minutes until you got the information back. Now, we can run your license plate before we ever get out of the car. What made you want to work with the First Responder Network Authority? Markley: When I was running the patrol district, I was the guy on the front line. For all of our major events from Super Bowls to NCAA Final Fours, we had decent radio communications, but an officer couldn’t step outside the event and get a call out because the airwaves were jammed. I was the SWAT commander during the 9/11 attacks. In the weeks that followed, the Arizona Diamondbacks were in the World Series against the New York Yankees. President Bush threw out the first pitch of Game 3. It was a planning and scheduling nightmare because of the security needed. Communications was our biggest issue. We had so many agencies that were working at that event, and we couldn’t communicate. The only way we could talk across agencies was to put one of our people with one of their people. If you do the math, that scenario quickly becomes a huge manpower drain. I now have a much better understanding of the importance of FirstNet and its role in keeping first responders safe. FirstNet is a lifesaver for public safety. That’s why I’m doing this. So public safety gets what they need. Where do you see FirstNet having the greatest impact? And the greatest future impact? Markley: The success of FirstNet will be measured by the person who is standing outside on the road doing the work. It’s not the police chief sitting in his office on the fourth floor, although he will appreciate the technology, but the personnel who are doing the daily work-- it’s much more a benefit for them. The biggest advantage of FirstNet will be for unplanned events, for the hurricanes, the school shootings, the terrorist events where there is no pre-planning involved. That’s not the time to have a communications crisis. FirstNet’s public safety specific capabilities like preemption and priority are huge. I am here to serve public safety, to advocate for them and their future needs. I am here to find out what they want from the system and to make sure the system is delivering what it is that they need. My motivation is safety and to make sure the network meet the extreme demands law enforcement and other public safety professionals place on it—when they need it the most. Sign up for his Law Enforcement Take newsletter HERE.